Just announced at CES is a new lineup of 4K ultrahigh definition TVs from Seiki, Westinghouse Electronics and Element Electronics that look to be smarter than the average smart TV. These new sets are the first to integrate Amazon Fire TV and Alexa, giving you all the benefits of Amazon's software without extra gadgets or cables. Software built into smart TVs can be notoriously hit and miss. Companies that make great televisions don't always make great software, so we're seeing an increasing number of TVs that integrate popular streaming media players. TLC integrates Roku into some of its sets (including one of our favorites, the TCL 55US5800), and Vizio integrates Google's Chromecast into its SmartCast models. It's no surprise to see Amazon jumping into the game too, offering anyone buying a TV on the Amazon site the option to add Fire TV without requiring yet another remote. If you already own a Fire TV, you know what to expect: easy access to all of your streaming content in one place and a universal search function that makes it easy to find anything you want. These televisions add access to live, over-the-air broadcasts (with a separate HD antenna) to the package, complete with a current show schedule, which brings all of your entertainment into the unified Fire TV interface. There's no word on how cable TV will integrate with the system. Amazon Prime members will find Fire TV especially compelling. 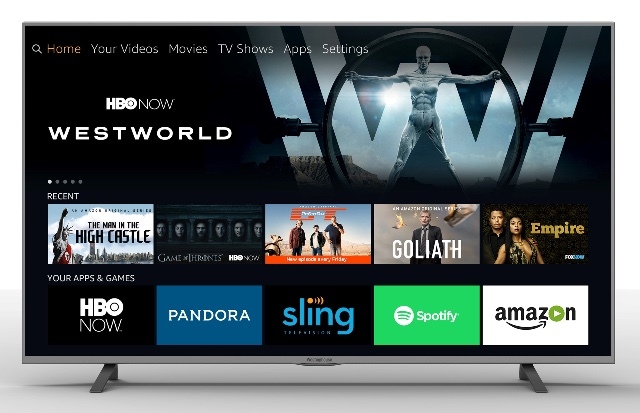 Fire TV provides easy access to the Prime Video streaming and lets users add premium channels through Amazon—some of them (like Showtime) at a discount from the usual subscription price. But the stand-out feature of these sets is Amazon's Alexa voice assistant. Each TV comes with a voice remote you can use to search for your favorite shows or handle any other Alexa-enabled tasks, such as checking sports scores or adjusting your smart thermostat. Alexa can perform a wide range of tasks, all of which will be available using these televisions. These Amazon Fire TV Edition sets all feature 4K ultrahigh definition resolution and will be available in 43-inch, 50-inch, 55-inch and 65-inch sizes. Though there's no pricing information available just yet, these TVs will be available from Amazon and other retailers later this year.